Hailing from Melbourne Australia, my young family and I reside in the laidback but eclectic neighbourhood of Koenji, Tokyo. 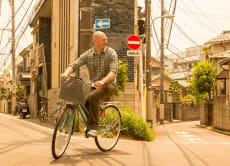 I have a passion for outdoor expeditions, Japanese bicycle restoration, a hot bowl of ramen, a cold beer and exploring the endless local treasures, personalities and culinary delights scattered throughout this bewildering city. As an avid traveller, I’ve always found myself shying away from organised tours, particularly the large group variety. - Rehashed itineraries glued to the tourist trail. - Visits to uninspiring attractions and restaurants the tour operator has a mutual relationship with. - The general sensation of being dragged around on a leash. 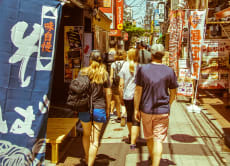 I launched DIG Tokyo Tours and my Airbnb Experiences as an alternative to this tour model, with the aim of crafting no fuss, immersive local outings that I’m proud to associate with my name and reputation. So jump on a bike or join me on foot in experiencing a less travelled side of the city that I call home. I hope to see you out and about in the streets of Tokyo soon and best of luck with those travel plans!